It’s January. For many of us, it’s that first long, cold month after the holidays, reminding us that winter is far from over with its cold, snow, and ice. But, to be fair, January isn’t all bad. With it comes the NEW YEAR, complete with a toasts of champagne and choruses of Auld Lang Syne. It’s a time of looking ahead to new opportunities and fresh beginnings. Likewise, this January marks the release of some great NEW PRODUCT at OneCause. Fundraising is an investment. We are all familiar with the good deal of time, thought, energy, and expense associated with planning and executing a fundraising campaign. Costs range from decor, to marketing, to entertainment, technology and, you guessed it: credit card processing fees. You’re likely aware that our OneCause Peer-to-Peer platform provides those supporting your run, walk, and ride participants with the opportunity to increase their donation to cover the credit card fee. You may or may not be aware that our Text2Give® and Online Giving solutions enable your Supporters to do the very same. However, the functionality hasn’t been in available in our Giving Center or auction software – until now. To help you retain as many of your total proceeds as possible, we’ve introduced Cover Costs throughout the entire auction event experience. Cover Costs is simply a means by which your Supporters can elect to increase their payment by a pre-determined percentage to help cover the general costs of fundraising. Easily turn Cover Costs on for one event and turn it off for another. Done! Turn it ON for the silent auction portion of your event and then OFF for the larger appeal. Yep! Turn Cover Costs ON while your Supporters purchase tickets (by the way, did you know we can help you with your Event Ticketing? ), but OFF for your event (auction items, donations, etc)? Easy peasy! Tailor the language of your cover cost “ask”. You got it! Customize the % requested based on your event. Yep, that too! In short, OneCause customers will find Cover Costs to be an extremely flexible solution to help maximize the power of your event proceeds. Many fundraising events utilize a traditional registration flow to welcome Supporters and note when each has arrived. But for larger, public events (e.g. stadiums, zoos, etc.) where registration often presents logistical issues, nonprofits are looking for new and easier ways to quickly register Guests. With our NEW Text-to-Register, Guests can use their mobile phones to text a unique keyword and immediately receive a custom message and link by which they can register for your event. We created this to take place in a single mobile transaction, so new contacts are not immediately required to create a username and password (we take care of that later!). Rather, they are quickly and easily entered into the system where they can begin engaging in mobile fundraising. If seating for your event is driven largely by your own internal contacts, Sponsors, or table captains, your life just got so much easier with OneCause Ticket Assignments. You can allocate tickets for your contacts to assign and, if needed, reassign. When it comes time to nudge them over the remaining unassigned tickets, our one-click login process makes it simple for everyone to complete their registration. We’ve also reduced the common challenges associated with “claiming” tickets, such as unclaimed tickets (think the dreaded “guest of”) or having guests claim too many seats. In fact, with our Ticket Assignments, there is no longer a need for anyone to “claim” anything. This means your guests can show up at the event without clicking the link to their ticket. It also means a Sponsor does not have to email each guest. Even if they don’t know a name of a guest, the ticket can still be assigned as “Rick’s Friend” or “Dora’s Husband”. The flexibility is remarkable. The Americans With Disabilities Act (ADA) guidelines for web applications are designed to help people who have visual or mobility impairments access web pages through screen readers, standard visual cues, and logical tabbing/clicking if a mouse cannot be used. Your Giving Centers, for example, are now more ADA-friendly. Giving Center pages have a logical tabbing order (for non-mouse users) and, where appropriate, the “Enter” key functions like a mouse click. Screen readers will also now work better interpreting and reading both text and images on the screen. Delivering a product that is sensitive to ADA guidelines is an ongoing commitment from us to you: to deliver a powerful solution that is simple to use and structured to delight every one of your guests. California nonprofits and numerous others scattered across the country may be required to charge sales tax on sale items. While you won’t find us offering tax advice at OneCause, we are happy to equip your fundraising software with our enhanced tax solutions to help meet a number of state and municipal requirements. Sales tax can now be calculated on the Item or Package level. This is perfect for the organizations that require tax only on certain types of sales (e.g. physical items vs. services) and want to tax only certain Items within a Package. Sales Tax can be calculated up to the value of the object sold, not the amount paid over value. For example, this is helpful when an attendee pays $110 for a $100 gift card. They are only taxed on the $100 value. The overage is not taxed, because that portion is tax-deductible. The above scenarios can even be used together. More flexibility at work. So, there you have it. New ways to connect with donors. 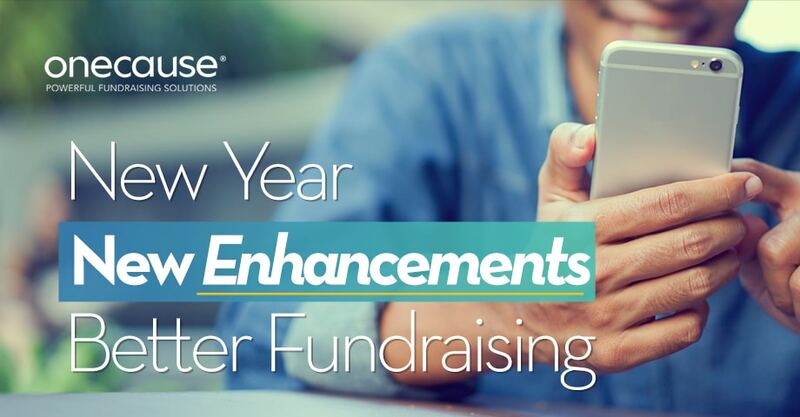 New ways to make your fundraising dollars go even further and streamline the donor experience. Makes for a pretty Happy New Year. If you’re a OneCause customer and want to learn more about these enhanements, simply reach out to your Customer Success Manager. If you’re not yet part of the OneCause family and think this all sounds pretty cool, wait until you see our entire suite of fundraising solutions. Reach out today and let us know how we can help!